Its 20-year celebrations, the Arts Access Awards 2015, the success of the Arts For All networks in encouraging more accessible arts events and services, and Arts Access Aotearoa's partnership with the University of Auckland’s Creative Thinking Project to promote the use of theatre as a tool supporting prisoner rehabilitation are among the highlights in the Chair and Executive Director’s report, published in the organisation's Annual Report 2015. Arts Access Aotearoa has always been guided by its central belief that everyone has the right to express and develop their creativity. It’s a belief that has sustained the organisation since it was founded 20 years ago in 1995. This year, we acknowledged the vision and leadership of all the people – current and former trustees and staff, artists, funders, partners, supporters and business sponsors – who have worked with Arts Access Aotearoa to increase access to the arts in this country over the past 20 years. 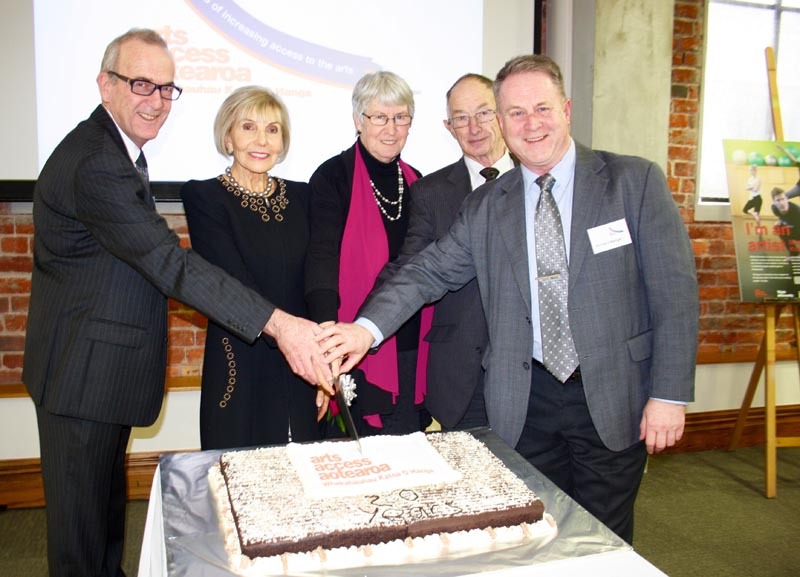 This included a special twentieth anniversary lunch hosted by Dame Rosie Horton and Chair Richard Cunliffe on the day of the Arts Access Awards. The celebrations continued at the awards ceremony, attended by 253 guests in the Banquet Hall of Parliament. Here, recipients were recognised for their contributions to enriching New Zealand’s artistic landscape and making the arts more inclusive and accessible. One of those people who has worked tirelessly to increase access to the arts in Christchurch is Neil Cox, Chief Executive of the Isaac Theatre Royal. Neil was responsible for the rebuild of the historic theatre after the Christchurch earthquakes. His commitment to ensuring the theatre became a model of accessibility earned him the Arts Access Accolade, presented by Accolade Patron Dame Rosie Horton. Looking back at 2015, much has been achieved as we work towards our vision of a New Zealand society where everyone can participate in the arts. We have added value to the social and community goals of central and local government agencies. We have raised public awareness and increased responsiveness to accessibility and inclusion. And we have built networks of people and organisations to share knowledge and experience, inspiring change. In late 2009, we published the first edition of Arts For All: Ngā Toi Mo Te Katoa. At that stage, there had been just one audio described show in New Zealand. Compare this to 2015, when we recorded 33 audio described and 18 sign interpreted arts and cultural events over the 12 months. 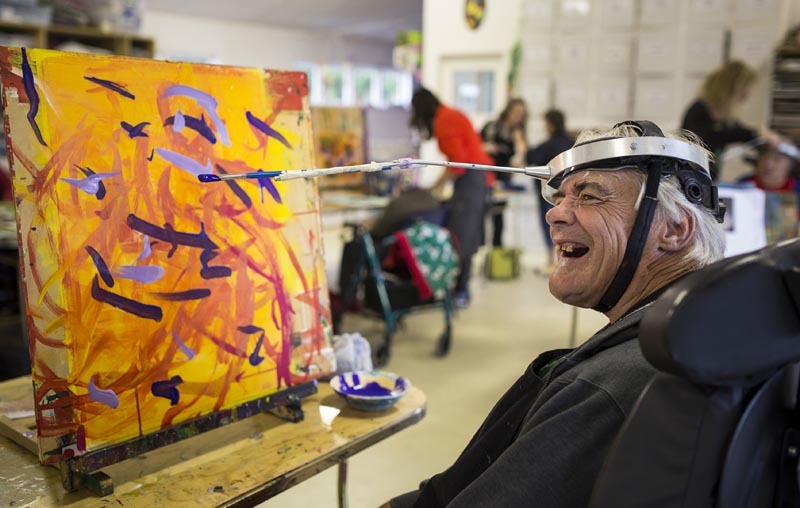 In total, 55 accessible services and arts events happened around the country in 2015 – and those are the ones we supported or knew of. There may have been more. 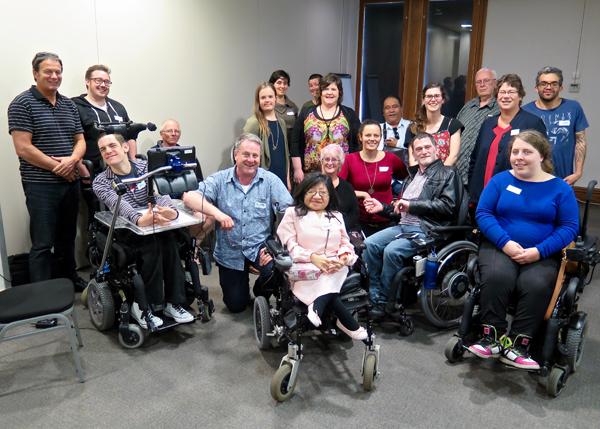 This is a great credit to the disability sector representatives, performing arts companies, venues, festivals, artists and producers we work with through the Arts For All networks in Otago, Christchurch, Wellington, Taranaki and Auckland. As a small national organisation with a big mandate, the most effective way for us to work is by building partnerships and networks. In 2015, with funding through the Ministry of Social Development’s Think Differently campaign, we established a national network of disabled advocates, and worked with them to build their advocacy skills and provide useful digital tools. Called Arts Access Advocates: A National Partnership, the project had three parts: a website, a video and a two-day symposium. The response to this project has been very positive and we will continue to build on this in 2016. Arts Access Aotearoa has a contract with the Department of Corrections to provide an advisory service to Corrections’ staff, volunteers and the wider community. A feature of 2015 were the visits of two international theatre practitioners: Curt Tofteland, founder of the Shakespeare Behind Bars programme in the United States, and Australian Penny Glass, who has been making theatre with male prisoners in Santiago, Chile since 2002. Curt Tofteland was the fifth Creative Fellow of the University of Auckland’s Creative Thinking Project. Working with the university, we delivered three Creativity in Corrections forums and three public speaking events in Auckland, Christchurch and Wellington. In addition, Curt visited Northland Region Corrections Facility. Here, he worked with staff and prisoners to form a performance group, guided by a process called Restorative Circles of Reconciliation. The group has become an established part of the facility’s arts programme. As a result of Curt’s visit, Arts Access Aotearoa set up three Arts in Corrections networks. These networks bring together artists, community arts workers, performers, academics and Corrections staff to progress the use of the arts as a rehabilitative tool in prisons and build creative pathways post release. Arts Access Aotearoa works with community-based creative spaces around the country to promote the important role they play in providing space, resources and assistance for people to create and participate in arts programmes and activities. Based on two surveys we conducted with creative spaces, we know that limited funding, resources and professional development opportunities are among the challenges many creative spaces face. Thanks to additional funding from our core funder Creative New Zealand, planning got under way in late 2015 for a national conference in April 2016, called Creative Spaces 2020: building a strong future for the sector. 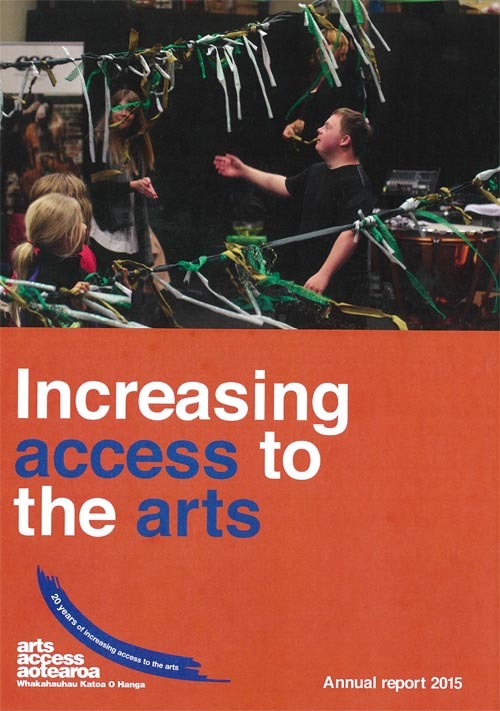 At Arts Access Aotearoa, fundraising has become an increasingly important role. Additional funding enhances our sustainability and enables us to build on the work we do across the country. A successful third Awesome Arts Access Auction, a movie evening, donations and grants mean we can report a small surplus for 2015. All of these achievements are due to the commitment of Arts Access Aotearoa’s staff, trustees, Kaumātua Bill Kaua, and Patrons Mel Smith, Miranda Harcourt and Dame Rosie Horton. This year, we farewelled board chair Richard Cunliffe and trustee Glen McDonald, and welcomed Awhimai Reynolds and Jeremy Smith to the board. We are also grateful to the wonderful volunteers who bring additional skills and enhance our capacity to increase access to the arts. We look forward to another great year in 2016. Original generation time 1.5824 seconds. Cache Loaded in: 0.0421 seconds.